Christmas urges us to reflect on the Mystery of the Incarnation. In a short video series, Fr. Eric Nicolai, an Opus Dei priest and art expert, helps us reflect on this mystery through religious art from the early Christians to roughly around the 18th century. Despite all the changes in the artistic depictions of the Nativity through the centuries, one thing always remained: an acute awareness of God’s presence in our world. The early Christians approached art as a useful tool for communicating the story of Jesus and Mary and the saints. Religious art at that time is more commonly called iconography. This happened mainly because Christians desired to know more about this child who came into the world by a young woman. Mary was therefore, early on, a favoured subject in religious art. She is often depicted pointing to Jesus in her arms and she received the name “Hodegetria” meaning “she who shows the Way”, that is to Salvation. The story goes that Saint Luke painted the original icon of the Hodegetria and it was later brought to Constantinople from the Holy Land thanks to the wife of the emperor Theodosius II. When images of the Nativity started appearing, they were inspired by the Infancy narratives found in apocryphal Gospels, like the one written by Saint James. His protogospel is known to have the longest account of Jesus’ infancy. His Gospel also asserts Mary’s perpetual virginity before, during, and after Christ’s birth. These gospels were not included in the official canon of scripture (the New Testament contains 27 books) approved by the Catholic Church today. Artists found inspiration in these infancy narratives to represent the birth of Jesus in icons. They focused on telling a story rather than concern themselves with having good composition or even realistic representations of each subject. This style is known as byzantine art. Saints and art have the power to direct our gaze towards what is beautiful, good and true. They both evangelize through the life they live and the stories they tell. In the 14th century, Saint Bridget of Sweden had a vision of the birth of Jesus. Her description of what she saw has been one of the most compelling accounts of the Nativity. It changed the way artists represented the birth of Jesus entirely. While the understanding of Jesus’ birth deepened, the style of religious art began to take a turn. 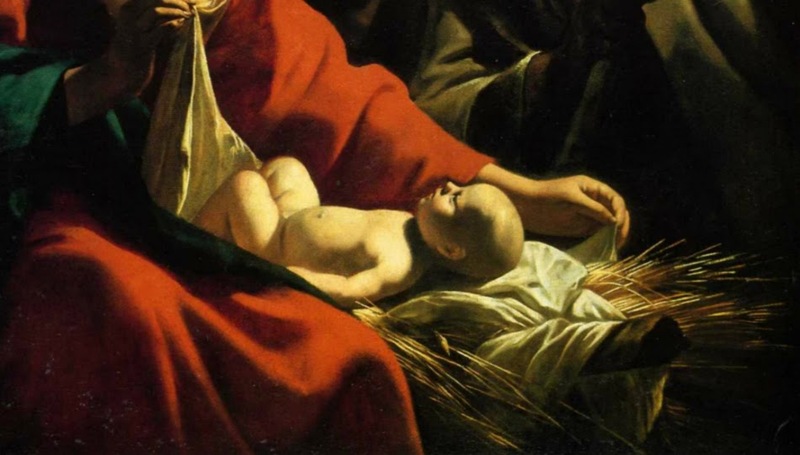 It sought less to fit as many elements as possible into one frame; rather it sought to resemble more closely the saint’s vision and focus on the child Jesus. Despite her clear vision, artists persisted in adding meaning to their paintings through narrative devices. The birth of Jesus often took place in what looked like a broken down temple; the backdrop represented the artist’s place of origin; the moment of Jesus’ conception happened in a bourgeois home or even a bedroom; and saints, members of the clergy, or art patrons, were inserted into these works of art. In the baroque period, they were abandoned. This happened, in part, as a reaction to the Protestant Reformation. Artists played with light and movement and hoped to bring the faithful closer to the action, creating more intimacy between them and the subject. This term is used to describe one of those narrative devices used to represent the moment of Jesus’ conception in Mary’s womb. Where, typically, one saw a dove coming down from heaven, artists replaced it with a small man “flying” towards the Virgin, holding a cross.